Moselle, a New York-based director of commercials and documentary shorts, was given a rare treasure trove of intel in the form of copious home movies that tell the Angulos’ story from early childhood. Born to a controlling, anti-establishment Peruvian father and an American mother, they were given Sanskrit names (Bhagavan, Govinda, Mukunda, Narayana, Jagadisa, and Krsna), home-schooled in the apartment, and taught to be paranoid about the incredible danger posed by everyone outside their home and family group. Their father was contemptuous of capitalism, and likened working to being a slave; the family seems to have lived in poverty, on government stipends. Apart from their formal education, the boys invented ways to keep themselves amused, in part by steeping themselves in popular American films, then typing out the scripts and re-creating their favorite movies at home. That low-fi film re-creation process, similar both in form and exuberance to the “Sweding” from Michel Gondry’s Be Kind Rewind, got the bulk of the attention when the film initially made the rounds at film festivals, winning the Grand Jury doc prize at Sundance. It’s a compelling hook: The Angulos had a lot of time on their hands, and seem to have poured it into making surprisingly accurate and detailed props and costumes out of whatever they had around the house. And the fact that they filmed their re-creations gives Moselle plenty of material to draw on for her doc. Buried deep in the film is a compelling argument for the power and pull of escapism, and the way these kids, told to expect violence from the outside world, accessed a safer version of that violence via movies, taming it and toying with it in their home. But Moselle doesn’t sell that message, or any other. She’s a hands-off storyteller, sometimes in ways that significantly limit the film’s impact: She doesn’t identify the brothers individually until the end of the film, and given that they’re all lanky, beaky boys of similar ages, with near-identical waist-length black hair, they become impossible to distinguish from each other, especially when seen in home-movie footage at a variety of ages. That’s particularly frustrating when they’re revealing their differences, either in confessional conversations with the camera, or by making breakout choices for themselves. (Moselle explains her thinking in a Dissolve interview here.) The film focuses on the Angulos’ past, sometimes at the expense of their future: As the family dynamic starts changing, the film moves faster, missing what seem like some highly significant moments. It’s so focused on the group—the “pack”—that it rarely digs into what any of this meant to them on an individual basis. And it leaves many glaring questions unanswered. There’s a sense throughout that Moselle prioritized polite observation, and letting the Angulos tell their own story, over any sort of journalistic or personal inquiry. In the process, she evades some of the questions of exploitation that always plague this kind of personal investigation of unusual people, but she also evades any sense of specific focus. 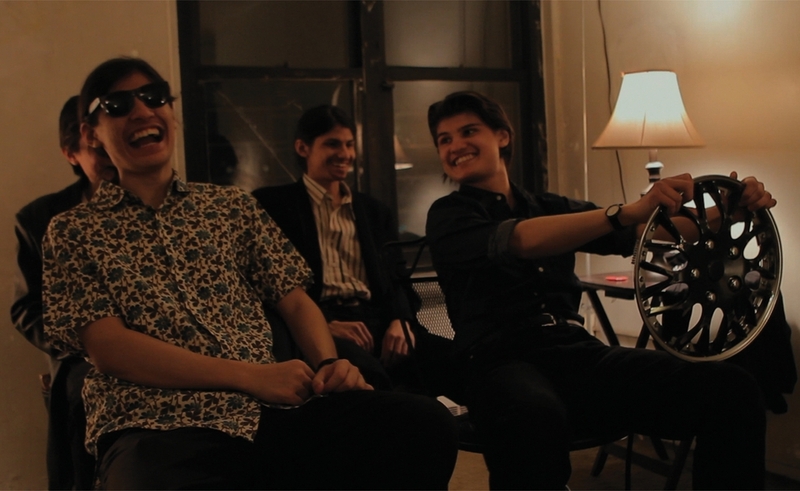 But for all its rough, unfinished edges, The Wolfpack is absolutely mesmerizing. The Angulos have an incredible charisma, a blend of shyness and forcefulness that feels like all the ambition and uncertainty of youth magnified by circumstances to an incredible degree. Some of the footage is tremendously startling—particularly the eerie Halloween ritual where the participants wear homemade movie-character masks and dance in a circle before lighting a bonfire in the apartment, though a moment when the boys’ mother calls her own mother for the first time in more than 15 years is an emotional blow of a different kind. But the story itself is more significant than any individual sequence. To some degree, The Wolfpack mirrors any story about growing up, establishing independence, and escaping both parental control and an enforced parental perspective. But it’s so unique in its particulars, with such sad and charming subjects, that it finds its own identity as clearly as the Angulos themselves did.